In 1818 the Baroness Anne Hyde de Neuville (1779-1849; image) painted a watercolor of Montpelier’s west façade. The work includes a comprehensive depiction of the Mansion and even includes images of James and Dolley Madison and individual slaves working around the house. Additionally the watercolor includes details of the surrounding landscape, including plantings and architectural features like the Temple. Because so few descriptions of Montpelier's landscape survive, the fullness of de Neuville’s work provides an important insight into the appearance of the land surrounding the Mansion after the ca. 1812 renovations. Significantly, the watercolor also includes the fence that was built in front of of Montpelier in ca. 1812. 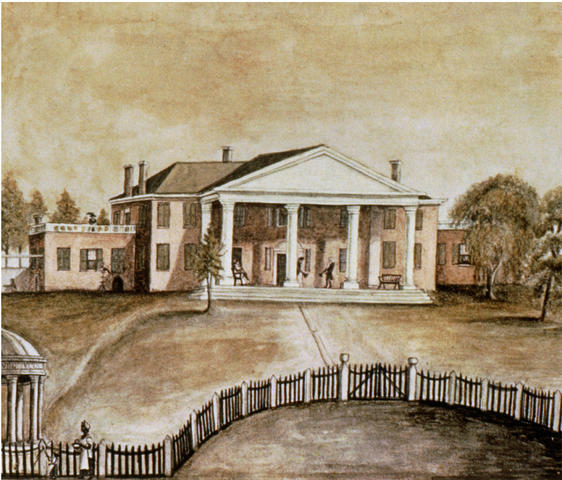 Because the plans for the 2004-2009 restoration of Montpelier included restoring elements of the landscape immediately surrounding the house, the watercolor would be a vital part of the investigation that led to the fence's reconstruction. A ca. 1818 watercolor of Montpelier painted by Baroness Hyde de Neuville.